It’s just an ordinary Monday morning, or so it seems. I sit among a group of men praying the morning services. The distractions of our fast-paced lives are evident in theI struggle to concentrate din of mumbled Hebrew words mixing with the sound of pacing footsteps. I, too, struggle to concentrate as my mind drifts to the tasks of the day ahead rather than focusing on the little black letters now swimming in front of me. Out of the corner of my eye, I notice a young boy hobbling through the door. He’s about nine or ten. His legs are barely able to carry his own body. Awkwardly, he stumbles through crowd, his head lolling to one side as his glazed eyes stare off into the distance. His arms flail at his sides and he collapses into the only empty chair in the room, the one right next to mine. I pity the poor boy. 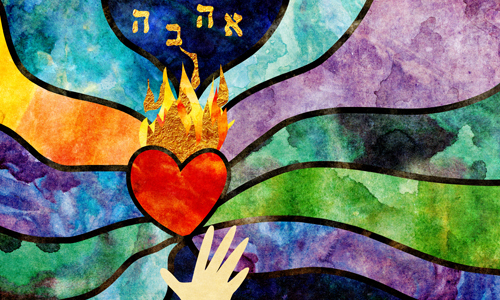 My mind veers away from the written liturgy as I ask G‑d, “Why?” Why can’t he be just like me? Why can’t he be like the rest of us here? The young boy shifts uncomfortably in his chair, his eyes darting back and forth across the room. I wonder if he knows what is going on around him. His arm reaches out to clumsily grab a nearby prayer book. He begins to turn the pages, and theI wonder if he knows what is going on around him haphazard motion crumples them as he goes. Then he stops and once again glances around. I can’t help but notice he has opened the prayer book up to the Shema. I wonder if he even knows what that prayer is. I pity myself. I look up once again and ask why. Why can’t I be like him? Why can’t we all be just like him? Leibel is a freelance writer living in Brooklyn, NY, with his wife and children.